The Steampunk Astrologer has just returned from Lincoln Steampunk Asylum – exhausted but very happy! The largest Steampunk festival in the world refused to let any negative effects of retrograde mars ruin the festival. It must have been a challenge for The Ministry of Steampunk as Mars was retrograde in Aquarius so group endeavours could very easily have been slowed. It takes a long time in planning every year but the results are amazing! Over 200 events from Thursday evening to Monday evening – I can’t begin to imagine the painstaking work it must have taken for the volunteers who put this whole thing together. The red planet was also retrograde in Capricorn so politics, authority etc. could have been more of a headache than usual for the team as Asylum started. Mars went direct on Monday. This was just after one of our well known Steampunk chaps proposed to his lovely lady member of the Ministry of Steampunk onstage. (Possibly helped out by dreamy full moon in Pisces). A gathering of Steampunks (and there must be a term for that – if not then there should be one!) brings out the best in all of us. Our two basic rules are to be splendid and to be nice to each other. Therefore there was lots of patience, tipping of hats, good manners and explaining to non-Steampunks exactly what was happening and why thousands and thousands of strangely dressed people were thronging the streets of Lincoln. Now we can look forward to an upturn in our energies. I know a lot of Steampunks have left Lincoln inspired to create and put into action ideas that have been inspired by The Asylum. I want to have a go at using a fabric hardener/ art medium to decorate my Victorian style walking boots. If that works out ok I may have a go at designing and making a Steampunk Astrologer’s fascinator. I’m not sure how successful I will be! The orrery hat I made to take this year was impressive but just too heavy to wear safely. It does feel like the brakes have been taken off and it’s time to start learning more new things. This change in Mars will affect us in similar yet slightly different ways – because we are all different individuals. 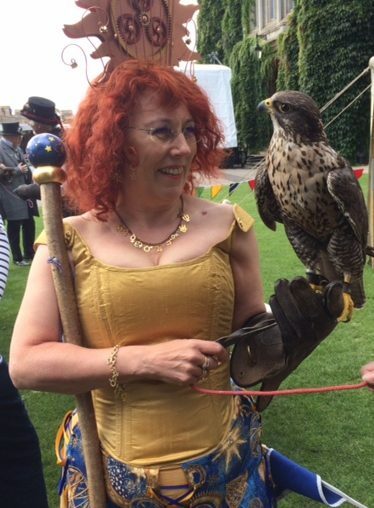 I’m ready to spread my wings – and speaking of wings – here’s a picture of me with Jack who along with his friends (owls etc.) was very mellow and didn’t bait despite all the hustle and bustle (pun intended) going on around him.